This historic gate was the grandest — and is the last survivor — of 14 gates in Berlin's old city wall (this one led to the neighboring city of Brandenburg). The gate was the symbol of Prussian Berlin — and later the symbol of a divided Berlin. Around the gate, information boards with pictures show how this area changed throughout the 20th century. There's a tourist information office within the gate. This island is filled with some of Berlin's most impressive museums (all part of the Staatliche Museen zu Berlin). The earliest building — the Altes Museum — went up in the 1820s, and the rest of the complex began taking shape in the 1840s under King Friedrich Wilhelm IV, who envisioned the island as an oasis of culture and learning. The island's imposing Neoclassical buildings host five grand museums: the Pergamon Museum (classical antiquities; this is undergoing restoration — and is only partially open till at least 2019); the Neues Museum ("New Museum," famous for its Egyptian collection with the bust of Queen Nefertiti); the Old National Gallery (Alte Nationalgalerie, 19th-century art, mostly German Romantic and Realist paintings); the Altes Museum ("Old Museum," more antiquities); and the Bode Museum (European statuary and paintings through the ages, coins, and Byzantine art). This gallery, behind the Neues Museum and Altes Museum, is designed to look like a Greek temple. Spanning three floors, it focuses on art (mostly paintings) from the 19th century: Romantic German paintings (which I find most interesting) on the top floor, and French and German Impressionists and German Realists on the first and second floors. You likely won't recognize any specific paintings, but it's still an enjoyable stroll through German culture from the century in which that notion first came to mean something. The included audioguide explains the highlights. This century-old church's bombastic Wilhelmian architecture is a Protestant assertion of strength. It seems to proclaim, "A mighty fortress is our God." This cathedral, while Protestant, is as ornate as if it were Catholic. With the emperor's lead, this ornate style came into vogue, and anyone who wanted to be associated with the royal class built this way. The church is most impressive from the outside, and there's no way to even peek inside without a pricey ticket. A shiny gilded dome marks the New Synagogue, now a museum and cultural center. Consecrated in 1866, this was once the biggest and finest synagogue in Germany, with seating for 3,200 worshippers and a sumptuous Moorish-style interior modeled after the Alhambra in Granada, Spain. It was desecrated by Nazis on Crystal Night (Kristallnacht) in 1938, bombed in 1943, and partially rebuilt in 1990. Only the dome and facade have been restored — a window overlooks the vacant field marking what used to be the synagogue. Inside, past tight security, the small but moving permanent exhibit called "Open Ye the Gates" describes the Berlin Jewish community through the centuries. Stairs lead up to the dome, where there's not much to see except the unimpressive-from-the-inside dome itself and ho-hum views — not worth the entry price or the climb. Germany's historic parliament building — completed in 1894, burned in 1933, sad and lonely in a no-man's land throughout the Cold War, and finally rebuilt and topped with a glittering glass cupola in 1999 — is a symbol of a proudly reunited nation. Its exterior and history are stirring, and it's fascinating to climb up the twin ramps that spiral through its dome. Because of security concerns, getting in requires a reservation (free; book online — spots often book up several days in advance). This exhibit sits on the site of what was once the nerve center for the Gestapo and the SS, the most despicable elements of the Nazi government. This stark, gray, boxy building is one of the few memorial sites that focuses on the perpetrators rather than the victims of the Nazis. It's chilling to see just how seamlessly and bureaucratically the Nazi institutions and state structures merged to become a well-oiled terror machine. There are few actual artifacts; it's mostly written explanations and photos, like reading a good textbook standing up. And, while you could read this story anywhere, to take this in atop the Gestapo headquarters is a powerful experience. The exhibit is a bit dense, but WWII historians (even armchair ones) will find it fascinating. This Holocaust memorial, consisting of 2,711 gravestone-like pillars (called "stelae") and completed in 2005, was the first formal, German government-sponsored Holocaust memorial. The monument was criticized for focusing on just one of the groups targeted by the Nazis, but the German government has now erected memorials to other victims — such as a Roma/Sinti memorial nearby in the Tiergarten, and a memorial to the regime's homosexual victims, also nearby. The memorial itself is free and always open, but the information center underneath (also free) it is closed on Mondays. Frederick the Great's former guardhouse (Wache), across Unter den Linden from Bebelplatz and the German State Opera, now holds the nation's main memorial to all "victims of war and tyranny." Be sure to read the powerful statement explaining the memorial's purpose (posted in English left of entrance). The memorial, open to the sky, incorporates the elements — sunshine, rain, snow — falling on this modern-day pietà. This wonderful example of communist art is on the north side of the German Finance Ministry (on Wilhelmstrasse, under the portico at the corner with Leipziger Strasse). The only major Hitler-era government building that survived the war's bombs, this once housed the headquarters of the Nazi Luftwaffe (Air Force). After the war, it was the headquarters for the Soviet occupation. Later the DDR was founded here, and the communists used the building to house their — no joke — Ministry of Ministries. The mural shows the communist ideal; the reality is portrayed in an enlarged photograph in the ground in the courtyard in front of the mural — showing a 1953 uprising here against the communists…quite a contrast. Placards explain the events of 1953. Built (with Swedish know-how) in 1969 for the 20th anniversary of the communist government, the tower has a fine view from halfway up, offering a handy city orientation and an interesting look at the flat, red-roofed sprawl of Berlin — including a peek inside the city's many courtyards. The retro tower is quite trendy these days, so it can be crowded (your ticket comes with an assigned entry time). Consider a kitschy trip to the observation deck for the view and lunch in its revolving restaurant (mediocre food, horrible lounge music, reservations smart for dinner). This is Berlin's most substantial memorial relating to its gone-but-not-forgotten Wall. Exhibits line up along several long blocks of Bernauer Strasse, stretching northeast from the Nordbahnhof S-Bahn station. You can enter two different museums plus various open-air exhibits and memorials, see several fragments of the Wall, and peer from an observation tower down into a preserved, complete stretch of the Wall system (as it was during the Cold War). Though this famous Cold War checkpoint has long since been dismantled, its former location is home to a fine museum and a mock-up of the original border crossing. The rebuilt guard station now hosts two actors playing American guards who pose for photos. Warning: The area has become a Cold War freak show and — as if celebrating the final victory of crass capitalism — is one of Berlin's worst tourist-traps. Here and in other places, hustlers charge an exorbitant €10 for a full set of Cold War-era stamps in your passport. Don't be tempted. Technically, this invalidates your passport — which has caused some tourists big problems. While the famous border checkpoint between the American and Soviet sectors is long gone, its memory is preserved by one of Europe's most cluttered museums. During the Cold War, the House at Checkpoint Charlie stood defiantly — spitting distance from the border guards — showing off all the clever escapes over, under, and through the Wall. Today, while the drama is over and hunks of the Wall stand like trophies at its door, the museum survives as a living artifact of the Cold War days. The yellowed descriptions, which have scarcely changed since that time, tinge the museum with nostalgia. It's dusty, disorganized, and overpriced, with lots of reading involved, but all that just adds to this museum's retro charm. If you're pressed for time, visit after dinner, when most other museums are closed. The new Potsdamer Platz was a vision begun in 1991, the year that Germany's parliament voted to relocate the seat of government to Berlin. Since then, Sony, Daimler, and other major corporations have turned the square once again into a city center. Like great Christian churches built upon pagan holy grounds, Potsdamer Platz — with its corporate logos flying high and shiny above what was the Wall — trumpets the triumph of capitalism. While most of the complex just feels big (the nearby shopping arcade is like any huge, modern, American mall), the entrance to the complex and Sony Center are worth a visit, and German-film buffs will enjoy the Deutsche Kinemathek museum housed inside. 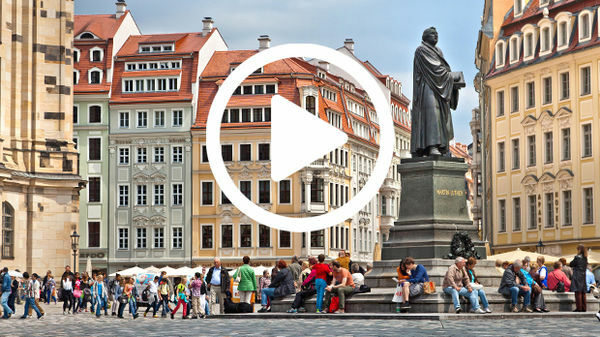 Hi, I'm Rick Steves, back with more of the best of Europe. This time we're in the fastest changing big city in Europe. It's young, it's vibrant, it's Berlin. Thanks for joining us. Zum Wohl! After a tumultuous 20th century — bombed flat in World War II, divided first by the victorious Allies, and later by its notorious Wall — reunited Berlin has resumed its place as the capital of Germany. And Berlin has emerged as one of Europe's top destinations. We'll climb the Reichstag dome and add color to the once deadly Berlin Wall, before joining a giant karaoke party. We'll ponder a Holocaust memorial. Then we'll marvel at the astounding transformation of once gloomy East Berlin and we'll take a cruise through the heart of the city on the Spree River. Berliners have a remarkable ability to embrace the present while surrounded by remnants of their tumultuous past. And for visitors, the city offers the delight of enjoying and learning from both. Sightseeing through its turbulent 20th century is an enriching experience. It's especially rewarding when you have a little historical context and an appreciation that many of the people on the streets actually lived this story. Berlin, Hitler's capital during World War II, was essentially destroyed in 1945. It then became the front line of the Cold War when the infamous Iron Curtain was drawn, and both Berlin and Germany were divided: half communist and half capitalist. After the Wall fell in 1989, the two Germanys — and the two Berlins — officially became one. And since then, this once thoroughly divided city has tackled the challenge of reunification, and, after a massive and costly rebuild, has effectively woven itself back together. The Brandenburg Gate is a glorious reminder that, long before the birth of modern Germany in 1871, the country of Prussia was the leading German state and a European power. Its capital was Berlin. While it's overseen plenty of war, the Brandenburg Gate was designed as an arch of peace, crowned by a majestic four-horse chariot with the Goddess of Peace at the reins. Berlin is built around a historic axis. Five hundred years ago, this boulevard was just a carriageway connecting the Prussian emperor's palace in the city center with his hunting grounds — today's sprawling park, the Tiergarten. The home stretch of that axis, leading to the palace, was Unter den Linden. This leafy boulevard — named for its linden trees — was, in its day, the Champs-Elysées of central Europe. With the reign of Prussian Emperor Frederick the Great in the 1700s, Berlin became a world class capital. Frederick was part of a dynasty, which ruled Prussia and then Germany until the end of World War I. In order to compete with Austria, France, and Russia — all of which had lots more people — Prussia became a virtual military boot camp. It raised Europe's largest army, Berlin was a military metropolis, and goose-stepping was in. Voltaire said, "Some countries have an army and in Prussia the army has a country." Today, Frederick the Great looks out intently over grand buildings, which symbolized his reign. A man of the Enlightenment, his vision was to create not just a military power, but a land of high culture…"a new Rome." Under Frederick, Humboldt University was instituted as the leading German center of higher learning, where Marx and Lenin would study and Albert Einstein would teach. To underline the focus on culture, an impressive ensemble of purpose-built museums fill Berlin's Museum Island. Galleries here feature art through the ages from Egypt and Ancient Greece to romantic age art that celebrates German nationalism. Before 1871, Germany was fragmented — a disorganized collection of little German-speaking dukedoms and kingdoms. But a unification movement was growing. And artists and intellectuals here were all about legitimizing the notion that Germany should be a single, independent nation. The Old National Gallery is filled with paintings from the Romantic 19th century, which made that case powerfully. 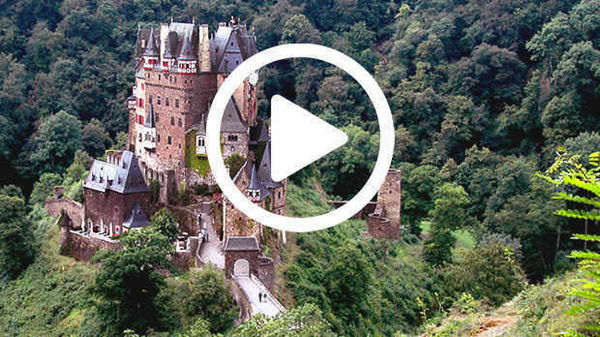 Dreamy castles harken back to Germany's misty medieval roots. Heroic struggles were waged for the fatherland. German cities were idealistic God-fearing centers of high culture. And Romantic patriots dreamed of a land where German-speaking people could raise their beautiful children true to their heritage. The Berlin Cathedral, built in the exuberant generation after the creation of Germany, towers over those museums. Stepping inside, you can see how the first German Emperor, Kaiser Wilhelm, ordered up bombastic decor, which seems to declare "we're here to stay." But like Berlin, it's definitively Protestant. Under its inspiring dome, heroes of the Reformation — like Calvin and Luther — stand vigilant, fingers pointing to the scripture as if to guard their theology. The square in front of the cathedral functions as a military parade ground…or a people's park, depending upon the tenor of the times. The tenor of the times these days — with the city rebuilt and thoroughly reunified — is peaceful and that's the feeling here on a lazy summer afternoon. Berlin is young, hip, and famously affordable. Just strolling through delightful parks and neighborhoods gives a fun glimpse into today's good times. Life here, especially in what was dreary East Berlin, is a poignant — even jarring — mix of tragic history, hedonism, and a now thriving economy. On this street, a venerable synagogue, once destroyed and now rebuilt, stands as a memorial to the Holocaust while police stand guard and, on either side, a trendy strip of restaurants and bars is jam-packed. Just around the corner, a still ramshackle courtyard that's changed little physically since communist times creates a bohemian chic vibe as an in-the-know crowd dines al fresco. Enjoying the moment, they're seemingly oblivious to how dramatically this neighborhood has changed since the wall came down. Getting to and from Berlin is easy. The Hauptbahnhof, the city's huge and thundering main train station, is one of Europe's mightiest, with several levels of tracks serving over a thousand trains a day — all encased in a vast shopping mall of commercial activity. While a massive public expense, Germans consider this a smart investment for both business and the people. And the city's subway is also highly developed. As in any big European city, when you commit to using public transit, you get around quicker and cheaper. The underground takes us to Berlin's governmental quarter. Germany dominates the European Union in part because of its effective government. The grandiose Chancellery is the official residence of the prime minister. It faces Germany's parliament building, or "Reichstag." With its motto, "To the German People," it's the symbolic heart of German democracy. The Reichstag has a short yet dramatic history. When inaugurated in the 1890s, the emperor dismissed the new parliament building as a "house for chatting." But after World War I, the German Republic was proclaimed from right here. Then, in 1933, a mysterious fire gutted the building, giving Hitler a convenient opportunity to blame the communists for the blaze in order to consolidate his hold on power. As World War II drew to a close, the Nazis made their last stand here. Imagine, Germans fighting Russians on its rooftop. After 1945, the bombed out building stood like a ghost through the Cold War. Then, with reunification, the parliament moved back to Berlin. This historic ruin was rebuilt with a modern element: this striking glass dome. A walkway winds all the way to the top. A cone of mirrors reflects natural light into the legislative chamber far below. As you spiral up, survey the city. The views are marvelous. But for Germans, with their dark recent history, the view that matters most is inward, looking down, literally over the shoulders of their legislators. The architecture comes with a message: the people are determined to keep a wary eye on their government. Berlin is dotted with memorials and reminders of its troubled 20th-century history. For a man with such megalomaniac ambitions, it's striking how little survives of the world Hitler created. The former headquarters of the Nazi air force, or Luftwaffe, now houses the German Finance Ministry. It's the only major Hitler-era building that — somehow — survived the war's bombs. Notice how the Fascist architecture is monumental, making the average person feel small and powerless. Just down the street, an exhibition called the "Topography of Terror"is built upon the bombed out remains of the notorious SS and Gestapo buildings. This spot, once the most feared address in Berlin, documents the methods and evils of the Nazi regime. Nearby is a sight with nothing to see: a parking lot — vacant…yet thought-provoking. It's the site of Hitler's vast underground bunker. In early 1945, as Allied armies advanced on Berlin and Nazi Germany lay in ruins, Hitler and his inner circle retreated here. It was right here, deep in his underground bunker, that Hitler committed suicide…on April 30, 1945. A week later, the war in Europe was over. In their attempt to exterminate the Jewish race, the Nazis killed six million Jews. Berlin's Holocaust memorial is a touching and evocative field of gravestone-like pillars. Called the "Memorial to the Murdered Jews of Europe," it was the first formal, German government-sponsored Holocaust memorial. When Germany called this a memorial to the "murdered" Jews it was a big step. They admitted to a crime. They did it. The design of this memorial has no explicit meaning. It's hoped that each visitor will find their own. There's no central gathering point; it's for individuals, like death. Once you enter the memorial, people seem to appear and then disappear. Is it a labyrinth? A symbolic cemetery? Intentionally disorienting? It's entirely up to you to derive the meaning, while pondering this horrible chapter in human history. A couple blocks away, is another poignant memorial [at the Neue Wache]. Marking the Tombs of the Unknown Soldier and the Unknown Concentration Camp Victim, it's dedicated to all victims of war and tyranny. The statue of a pietà, Mother with her Dead Son, is by Käthe Kollwitz, a Berlin artist who lived through both World Wars. With the end of World War II, Berlin was divided between the victorious allies. Eventually the French, British, and American sectors became West Berlin and the Soviet sector became communist East Berlin. For the next four decades the people of East Berlin were subjected to lots of propaganda and that included art. Socialist realism — the art of the communist era — actually went beyond censorship. Art was legitimate only if it actively promoted the state. This mural, Building the Republic, dates from 1952. It's a classic example of Socialist Realism, showing the entire society delighted to work together toward the Marxist utopia — industrial workers, farm laborers, women, and children... all singing the same patriotic song. The communists also built Berlin's 1,200-foot-tall TV Tower — quite an impressive erection back in the 1960s. Its purpose, along with better TV reception: to show the power of the atheistic state at a time when East German leaders were having the crosses removed from churches. But when the sun beamed on their tower, a huge cross reflected on the mirrored ball, high on the grandest spire in East Berlin. Cynics called it "The Pope's Revenge." This boulevard has long been a main drag. Destroyed during World War II, Stalin decided this street should become a showcase for communist East Berlin. In the 1950s, he had it rebuilt with lavish Soviet aid and named it "Stalin Boulevard." Today this street, built in the bold Stalin Gothic style so common in Moscow back then, has been restored and renamed for Karl Marx. It's actually becoming en vogue, and gives us yet another glimpse at what was communist Berlin. But even with massive housing projects and lots of clever propaganda, it took a wall to keep the people of East Berlin from leaving. The "Anti-Fascist Protective Rampart." That's what the East German government called this Wall. They built it almost overnight in 1961 to stop their people from fleeing to freedom in the West. Over two million East Germans escaped before this wall was built. The Berlin Wall Memorial is a stark reminder of the millions trapped behind this wall before it came down. Within its park-like grounds which were once a no-man's land are information posts and photos of people who died trying to cross the Wall. The Wall was actually a complex of two walls: the outer one was a 12-foot-high concrete barrier — its rounded top was designed to discourage grappling hooks. Sandwiched between the outer wall and an inner wall was a no-man's-land (or "death strip"). The complex circled what was West Berlin, stretching about 100 miles — it effectively made the western sector of the city an island in the middle of communist East Germany. And always vigilant were many lookout towers. East German guards manned about 300 towers like this to stop anyone attempting to escape. Only a couple of these still stand. Checkpoint Charlie — the most famous border crossing between the East and West — stood about here. Once a tense and foreboding place, it's now a garish commercial free-for-all. Where serious military guards once stood, today actors pose playfully with tourists. Symbolizing the nerve-wracking stand-off of the Cold War: a young American soldier faces east and, on the flipside, his Soviet counterpart faces west. The adjacent museum, the House at Checkpoint Charlie, shows how desperation drove East Berliners to all kinds of creative escape attempts — over, under, and through the Wall. Escapees would hide, crammed into tiny cars. This one drove six people to freedom before finally being discovered. In another car, a person was actually hidden in a false gas tank. And this vehicle — armored with concrete and iron plates — simply blasted through under a hail of bullets. Exhibits show how tunnels were used for transporting people to freedom. Rooms recall the artful diplomacy of the age, including President Reagan's famous speech. Reagan: Mr. Gorbachev, open this gate. Mr. Gorbachev, tear down this wall. And the last room celebrates the happy ending, the euphoric days in 1989 when people-power literally tore down the Wall. With the Wall gone, the two Berlins were mended together and the scars of the Cold War began to fade. Potsdamer Platz is a symbol of Berlin's rebirth. Before World War II, it was the Times Square of Berlin — famously one of the busiest squares in Europe. It's hard to believe, but during the Cold War — as recent as the 1980s — this entire area was a desolate and deadly no-man's land. This line marks where the infamous Berlin Wall once stood. That was East, that was West. And back then, standing here, I'd be dead. Now big business has moved back in, turning this area into a towering office park and shopping mall. Eastern Berlin has become a bustling part of the city. This huge square, Alexanderplatz, was a commercial center of East Berlin in the communist days. Today it's an explosion of capitalism with a relaxed and fun-loving atmosphere. But to really feel the vibrancy of the new Berlin, I enjoy exploring residential neighborhoods deeper in the former Eastern Zone. Young, in-the-know locals agree that Prenzlauer Berg is one of Berlin's most colorful neighborhoods. It's a classic case of an old workers' quarter becoming trendy. Prenzlauer Berg was bordered by the Berlin Wall. Today, what was once a former death strip along the Wall is a fun-loving park. The remains of the hated wall are now a showcase for counter-culture graffiti artists — a canvas for free-spirited spray-painters. The Mauerpark, or Wall Park, hosts a parade of alternative lifestyles. It's a youthful culture of people with no living memory of communism. There's plenty of picnicking and lots of entertainment. And each summer Sunday, the park hosts a giant karaoke free-for-all. Karaoke singer: Let's do the Time Warp again! Let's do the Time Warp again! To better understand this dynamic city, I'm joined by my fellow tour guide and local journalist, Holger Zimmer. Holger: Well, this is Prenzlauer Berg. This is my neighborhood, really, you know? And I've been living here since the end of communism and I've seen a lot of changes here. It's a fine example of how Berlin developed. Back in the 1850s, '70s, Industrial Revolution comes along, the population of Berlin doubled within the space of 30 years, from one to two million, so people needed apartments, people needed space to live, so that's why all these buildings were built. Rick: A huge building project. Look at this, lots of workers' accommodation. Holger: And we were lucky that we can still see it, because they haven't been destroyed in the Second World War. So that's pretty much survived here. And then after '45, this is East Berlin here, this is communism, so people don't pay rent, so the buildings actually collapse, fall apart. Rick: So it got really run-down during communism. Holger: But that means when '89 comes along, the Wall falls, people move in, young people, students, creative people move in here, and they basically take these old buildings that no one else wanted to live there anymore, with coal heating, with like a toilet that's just kind of like half a floor down, and they come and live there, you know, and they doll it up and they change the place completely. Rick: Must have been a very creative time. Rick: So that's gentrification. It's cool, people come in with money, the creative people move out, and now you've got comfortable, desirable apartments. Holger: And like me, like, I came here as a student. Now I have kids and I enjoy living here. Rick: So you don't have to go downstairs for the toilet. Holger: Absolutely, yes. And I don't need to bring up my bucket of coal anymore. Rick: I love these happy little crossing signals. They're so jaunty. Holger: Yeah, that's one thing people here really kept from the communist times, and they really fought for them. Rick: It's a popular demand. Holger: And we call them Ampelmännchen. Holger: So here's a place where the old spirit still survives. Rick: Let's take a peek in. Rick: So this was originally squatters. Holger: This was a squatter place, yes. Next door. Rick: And today, today they're paying rent? Holger: Today they're paying rent and they still care for their house, they still do something, of course. They don't have much money, but they still keep it up. Former squatters now have a place to stay. The Spree River — which cuts through the heart of the city — has taken on new life. A relaxing hour-long boat tour — which comes with an interesting narration — is both time and money well-spent. It's a poignant cruise because this river was once a symbol of division. But today, Berlin is thoughtfully incorporating the river into a people-friendly cityscape. 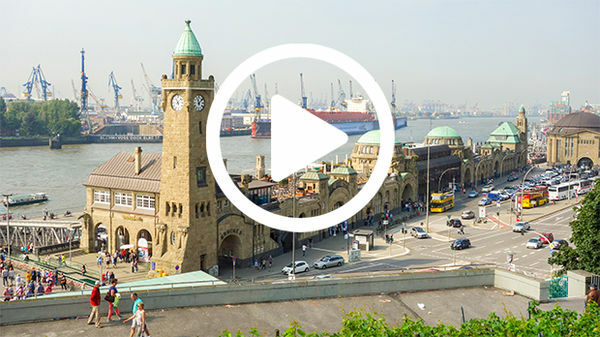 Cruising along a delightful riverside path, you'll pass the impressive new buildings housing the German government, fine bridges symbolizing the new connection of East and West, and inviting "beach cafés." Berlin. Visitors here are understandably fascinated by the Nazi sights, communism, and the Wall. But for today's young Berliners, that's history. In their city, former military parade grounds are where you go for a tan and the Wall is simply a back drop for a party. For any Berliner under 30, their world has always been capitalistic, democratic, free, and peaceful. Reflecting on its past while energized by a promising future, today's Berlin is an old city with a new spirit. I'm Rick Steves. Until next time, keep on travelin'. Auf Wiedersehen. To stop their people from freeing to fleedom in the west. Freeing to fleedom. Fleeing to freedom in the west. Berlin's an old city with a young past. Until next time... Keep on travelin'.